Eeeek! It’s three days to Christmas! 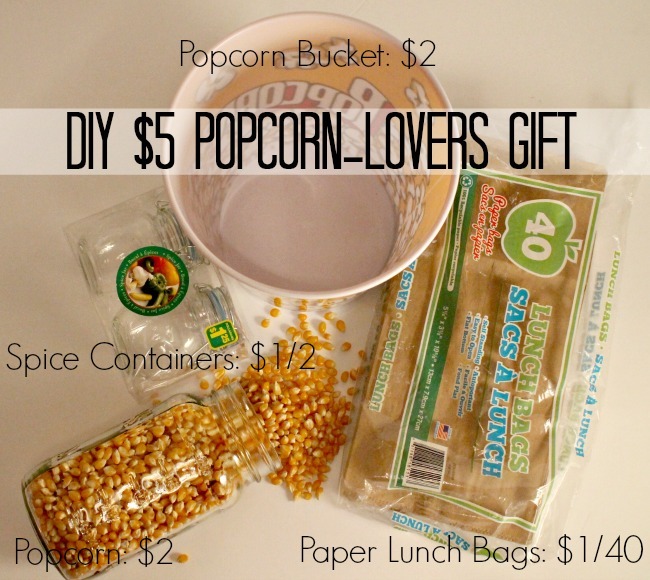 Here’s a quick and simple DIY gift for the popcorn-lover on your list. Bonus! It won’t cost you more than $5! 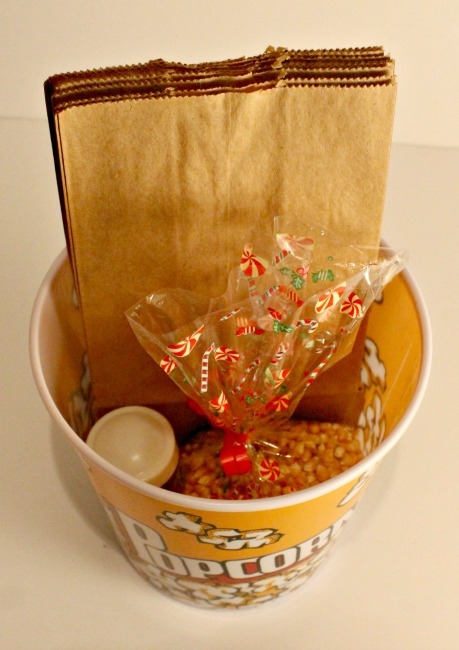 Take 6 paper lunch bags out of the package, and place them inside the popcorn bucket. Measure out 2 cups of popcorn kernels, and put them into a nice, pretty bag. As an alternative to this, you could buy some snack-sized ziploc bags at the dollar store (again, $1), and measure out 1/3 cup of popcorn into each. Create your popcorn seasoning, and fill up one of the shaker bottles with it. You could even make a couple of different kinds and include more than one (instructions follow below**). Write a note with directions to your friend, or you can use mine (see below). Include the note in the popcorn bucket, as well. Wrap it up pretty, and gift! *I stopped buying microwave popcorn quite a while ago. I was a bit scared of what was in there. If you know the person has an air popper, you can skip the lunch bags. 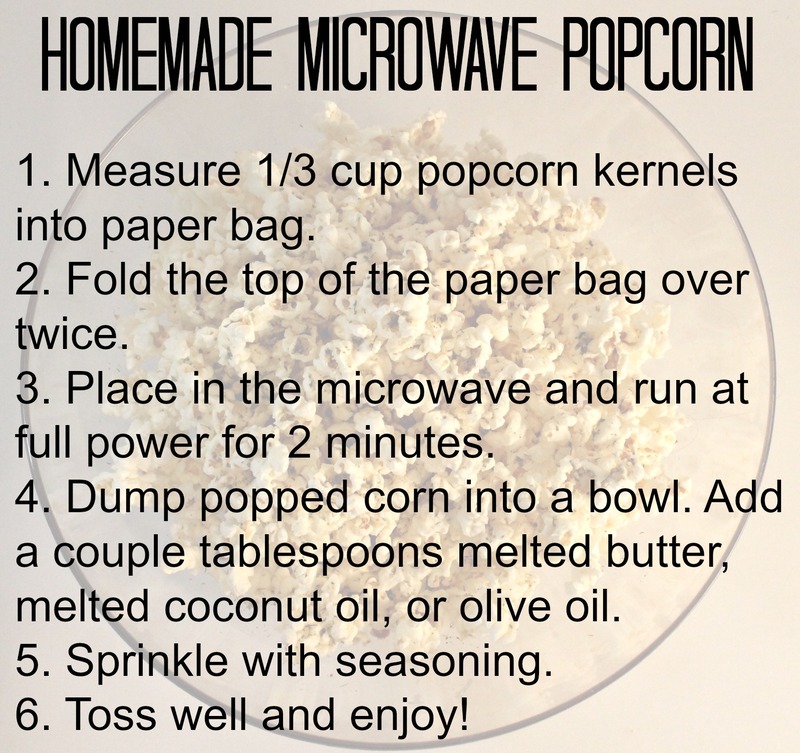 But making popcorn in the microwave has been my go-to method for the last couple of years, and it’s awesome. Read all about it here. Get creative! Here are a couple of tutorials for making your own that I pinned: Popcorn Seasoning Kit, and 50 Flavoured Popcorn Recipes. Here’s one I really like from Thug Kitchen. As a bonus, it’s vegan, as it’s made with nutritional yeast (or nooch), which has a nutty, parmesan-like flavour. Combine: 2 tbsp nutritional yeast, 1 tsp dried basil, 1 tsp dried dill, 1 tsp garlic powder, 1 tsp salt.